Are the Bears losing steam down the stretch with another loss? The Bears and Brandon Marshall lose despite his record setting day. 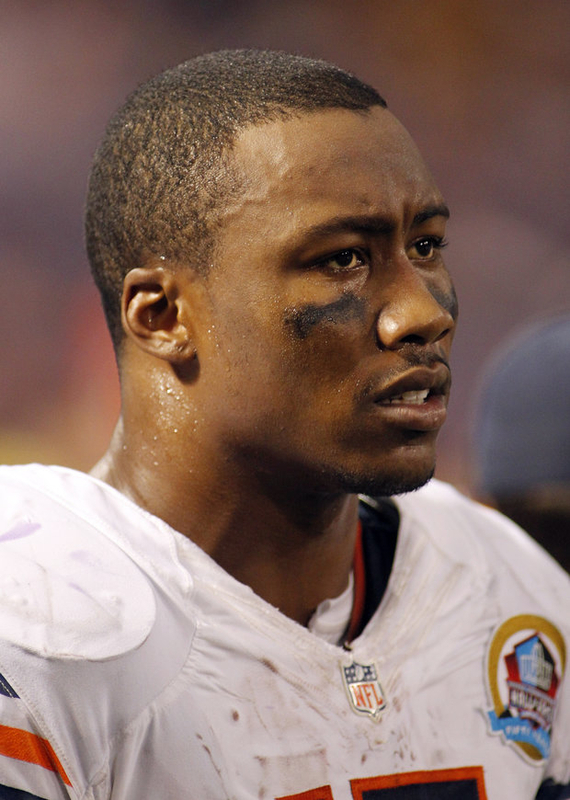 Despite setting a Bear record-Brandon Marshall and the Bears lose. Is it déjà vu all over again for the Bears? After a 7-1 start for the season they are now 8-5 and their playoff picture gets hazy after losing to Minnesota 21-14. Last year after a 7-3 start, injuries hit the Bears and the wheels came off. It was the Adrian Peterson show from the first snap for Minnesota. The Vikings drove down the field on the opening drive powered by Peterson&apos;s running. He capped that drive with a 2-yd score and got into the endzone-- again-- moments later after a Jay Cutler interception. The Viking running back amassed 125 yards in the first quarter and 154 yards for the game. Petersen is having a monster season after returning from his ACL injury--Bulls fans may be encouraged about Derrick Rose after watching him play. The Bears tried to play catch-up all game, down two scores after three minutes. Cutler was able to connect with rookie Alshon Jeffery in the final two minutes of the half with a 23 yard pass reception for a touchdown. The Bears had several drives that stalled and were unable to overcome the deficit. Cutler’s second interception in the third quarter was costly. The Bears quarterback’s pass intended for Brandon Marshall sailed over the receiver’s head into the hands of Harrison Smith and the Viking defender ran in for a touchdown. Knowing the Bears had to throw to get back in this game, Minnesota applied pressure to the Jay Cutler. The Bears QB scrambled and got some incredible catches by Marshall. The big receiver had 10 receptions for 160 yards. Marshall has caught more balls in one season for the Bears-101- breaking Marty Booker’s mark from 2001. There are still three games for him to add to that total. As the game was winding down, Cutler was on the sidelines with a sore neck after taking another beating; Marshall caught a touchdown from back-up quarterback Jason Campbell. Too little—too late. Petersen’s romp through the Bears defense early in the game magnified the missing starters. Injuries have taken its toll-losing Brian Urlacher and Tim Jennings. Before the game Defensive tackle Stephen Paea was ruled before the game. In reality-- the Bears defense can’t be faulted. In the second half, they made good adjustments; there is not much they could do with when the offense gives up the winning score. For the game, the “D” held Christian Ponder to just 11 of 17 for 91 yards and an interception by Major Wright. Petersen only had 20 yards the second half. If you look at the final statistics-you would believe the Bears had won the game. The Bears had 438 total yards to the Vikings 248—the final score is the only numbers that matter. The receivers dropped too many key passes, Devin Hester and Alshon has balls that should have been caught for touchdowns. Marshall dropped some too, however, overall you cannot fault his game. What is the long-term status of Robbie Gould? He strained his left calf during warm ups. In essence he was available for only point after touchdowns. The Bears were forced to punt rather than a long field goal. There were other injuries that could be factors on special teams-Shea McClellin, Craig Steltz and Sherrick McManis all went down in this game. May not seem important-but their roles are essential to a team that depends on their play. Can the Bears rebound next week against the Green Bay Packers? The Packer are a team they have been unable to beat and a game that will have huge consequences for the playoffs. Despite a team that has also been hit with injuries, Green Bay still has been able to find ways to win. Right now looking at this Bears team, they are banged up-not in sync-despite some great individual play. They better get it together these final three games—or they will enter the New Year watching the post-season—again.